Is it because I want more money? Why do I want more money? Is it because I’m chasing security? Is it because I want to help more people? Why do I want to help more people? Is it because I want approval? In the end, it comes down to approval, security, and control. When I let go of the need to try to get any of those through external means, I immediately feel my shoulders drop and find myself taking a deep breath. Life will nudge me to grow anyway. I don’t have to force anything. I know this goes against conventional advice. But then again, most business people are burned out and unhappy. Sure, they may have money and success, but money and success do not bring long-lasting happiness. Happiness comes from within. We don’t experience the world directly. We experience it through our thinking. That means a rich person can be depressed, and a poor person can be at peace. If I have a plan, it’s to follow what fascinates and interests me. I follow the breadcrumbs of enjoyment, excitement, and passion. My business plan takes second-place to following the breadcrumbs of life. As I’ve grown Wake Up Cloud, it’s been more about serendipity and synchronicity than anything else. When a new idea comes along, I’ll either follow it or not based on how magnetic it feels. For example, during the summer of 2013, I suddenly got inspired to get into Kindle books (check out my books here). Writing books hit all my marks. I didn’t have a plan written out about writing Kindle books. I did it because I felt drawn to it. When I thought about writing Kindle books, I felt excitement, joy, fascination, and a magnetic pull. It wasn’t always strong. Sometimes it was subtle, like a gentle gust of wind moving me in one direction. Another example is YouTube. When I began recording more videos on my YouTube channel, I did it because it felt alive. I have a direction, and sometimes I even have goals, but I never take either too seriously, because I know life will lead the way. Life will nudge me in certain directions, and my inner GPS will tell me when I’m on the right path by the amount of excitement and interest I feel. I used to worry about whether or not I was on the right path, or doing things the right way. I still experience worry, but I don’t take those thoughts so seriously. Instead, I listen to my inner GPS, to the subtle nudges I get. I listen for a peaceful feeling, you could say. Life may work out, or it may not. I may freak out in the process, but ultimately, it’s all going on in my head. We feel our thinking, and if we relax, that thinking changes. You don’t have to control your thoughts, because in a moment new thoughts will emerge. So how do I enjoy living life without a plan? I let go. I let thoughts of fear and worry pass. You see, you don’t have to fix your thinking. Deep down, you are already happy and fulfilled. What’s obscuring your innate nature is your thinking that you need to do something about it. When you want to do work you love, and when you want to follow your passion, it starts with becoming quiet and letting your inner wisdom guide you. It may not be easy, but you’ll get better at it. There’s nowhere you need to be except right here, right now. It’s thinking that you should be somewhere else that makes you miserable. P.S. If you’d like to dive deeper into this topic, I invite you to check out my book Follow Your Heart: 21 Days to a Happier, More Fulfilling Life. I can never have your courage not matter how I wish. Possibly because when I was growing up, we were always lacking. There is a continued sense of insecurity. But it feels good to know that you think the way you do. Possibly, one day, I will learn to let go. You probably know what I’m going to say. I think you can let it go, and I think anyone can, because deep down we’re all the same. If you cannot do it yourself, you can hire a therapist to help you release the past and what is blocking you. The worst thing is waiting for it to happen because it never happens. I feel like Henri’s advices are amazing but I also believe that they will only work for people who don’t have internal conflicts and unresolved issues from childhood. Good point, Gloria. And that’s why it’s so important to listen to what resonates for you. Don’t take my advice as a formula, but test it in your own life. I have plenty of internal conflicts, by the way. But again, only you know the best path for you. Some people have such a poor,destructive upbringing, i.e. unfit parenting that they have suppressed negative emotions they are not aware of,suppressed incorrect beliefs that they are not even aware of.Clinical psychologists using verbal therapy with bioenergetics,the Option method are unfortunately needed for those people.These are not the ordinary conflicts we are aware of,like when we have like pro and con difficult choices. Some people have had a tough time, but even they can get relief. Thanks Phil! Therapy really helped me break free from many of my childhood issues.To be specific, bioenergetics with verbal therapy and the option method to shine a light on one’s own beliefs that are fueling unhappiness.I really like Henri’s wisdom here. Thanks for sharing that, Phil. Always good to know what works and what doesn’t! @Stuart, if you learned to “hold on” then you can also learn to “let go”. These are just mental habits that feel unchangeable because we have been repeating them for so long that they become automatic. (And the stories we’ve been using to reinforce this image of ourselves make it seem even more unshakeable). If you can hold the behaviours you don’t like about yourself in awareness without harshly judging yourself, then over time they will lose their power and as you make new choices in the direction you want to go – choices that at first seem uncomfortable (like learning to tie your shoelaces for the first time) – then over time you will find yourself in a completely different place with a completely different story. Sometimes it helps to seek help with this from a professional or from a good role model – that depends on the individual. Glad to hear that, Esme. Thanks for sharing your thoughts! 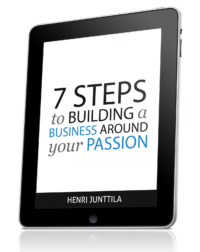 Hi Henri – loved reading your post today! I have just resigned from a secure, well-paid job that held no interest or passion for me at all. Life gave me lots and lots of nudges that I needed to make a change, which I ignored until I just couldn’t ignore it any longer as it was making me ill. I am going to work freelance and have no idea what is ahead of me! I cannot plan it, I just have to go with it and embrace the uncertainty. It’s scary, but exciting – so your post really helped me today – thank you! You and I share such a similar story! I quit my well-paying job in IT almost 4 years ago to blaze my own trail 😉 And haven;t looked back since. Right on. Right on! Right on. Bravo Henri!!! Well said and well written. You are right on with this post. In many, many ways, I agree and in fact I don’t think I am much of a planner myself. I’ve had wins and loses because of that. For example, during a typical day, I’d pick up a task from my to do list that I “feel” like doing, and finish that first. In doing so, sometimes, the more important ones are left out, but my inner nagger doesn’t allow me to sleep before I finish those important ones too, so in a way it’s all good. Thank you Henri for living what I always knew to be ‘right’ way all along. I now charge you with encouraging the rest of the world to live in this truth!!! From my understanding it would be a much happier and more peaceful place to be if we all did so. We think similarly, Henry! In a lot of ways, I don’t plan too much in my head. When there’s something I want then obviously I will think of the best way(s) to get it, but there’s no long-term dream in my head that I’m after. In some ways that’s not a good thing but I personally enjoy the excitement and the unknown of it all. “It’s thinking that you should be somewhere else that makes you miserable”. Henri, i feel so free readign this post. thanks. it seems like you’ve been reading my mind while you wrote this. I feel like I totally lost direction in my business, since I’m not aware anymore of which projects I should tackle and which I shouldn’t. The only thing I know is that I want to explore more different topics than I can manage at a time, so I need to prioritize my tasks. I’m in the learning process of how to let go of detailed plans. I agree that life always finds a way to make detailed plans useless – and still I’m doing those. Maybe I should rather be focusing more on the WHY instead of the HOW in my projects. This post definitely lead to the insight of the day, so thank you Henri! I just finished reading Rework by the guys from 37signals and this post lines up perfectly with one of their principles: business plans don’t work. They argue that writing a long-term business plan is a joke because no one can see all the variables that will occur in that period of time, so it’s a waste of time trying to plan that far ahead. Love it. This is perfect for me right now. I’m really trying to put more time into building my blog and I get all wrapped around having to plan and prepare for everything. Looks like I need to let go a bit. The 37signals guys are a smart bunch. I find people try to plan too much. They try to plan to perfection, but that isn’t possible. You have to start, and you have to let things get messy. Henri, I really like your choice of poetic phraseology, “serendipity and synchronicity”. I think it sums up quite well your desire to be balanced, and not too driven by ‘plans’ and ‘goals’. Finding this balance is the key to life. // Nice post. Your post makes a lot of sense. As long as you have that general vision of what you want to achieve, then you can follow what excites you everyday, and things will just turn out well and your business will prosper. I enjoyed reading this post. I think you hit at some tough areas for most people as we [as do I ] grapple with doing what we love to doing what is expected of us. With family responsibilities, and people at work relying on you to “take care of their sh##”, it seems a far reach to maintaining the mindset that you can do anything and be happy if you just put your passion into it. I have been working on writing for quite a few years now and finally have published several titles but not enough to retiree from my “day job” that could never live up to the passion that I have [similar to what you said] when sitting down to write or create something that is truly “yours”. what I have come to realize as well after reading this post is, you can “survive” work that is not what you want to do, as long as when you have free time you are working towards that one thing you DO want to do more than anything. It may take years, but if you do nothing, you could end up suffering a lifetime. That’s all I had to say, and thanks for the weekly posts. Yup. Small steps does it. And you may find that the more you take small steps toward what you enjoy, the more you start enjoying the rest of your life (maybe even that job you used to hate). Interesting how that works. I have a feeling I’ll be walking around for several days with that last line sounding in my head: “It’s thinking that you should be somewhere else that makes you miserable.” I have never looked at it that way before, yet it makes total sense to me. Thank you for that! It may also help me stop and realize that even though I am going after big dreams, where I am right now is where I am supposed to be. This is the article I needed today. Thank you so much, you always have great wisdom Henri because you know that peace is the most important thing in life, not just doing great at business. So, thank you once again! Started my first business in 1980 (internet didn’t exist yet) i was 27 years old,everything was going very well i had achieved a secure income,or i thought i did, then everything changed in 1988,the economy and competition made me close , then i opened a different business in 91 after learning a new trade, it only lasted 4 years,i had to make a course correction that made me move to a different city, to make a long story short, what i have learned in my 43 years of being an entrepreneur is that “Nothing is forever” especially in this times,people here in the USA are still unemployed and can’t find their place.Some people with masters degrees are making 12 dlls an hour. You better have a second or third income , don’t put all your eggs in one basket (Don’t rely only on the internet, for your only income,it can change at any time) The truth today is that you can not trust that your employment or business will be there 3 years from now, the new way to survive is to start to learn of the small indicators that happen before a big change in the economy or business, and do the appropriate changes in your business,life,employment etc. because if you don’t you will be hit with a reality that you will not like. You are correct Henry , life is always throwing you curved balls and you better know how to dodge them,but you should worry in a positive controlled way that will make you get ready for any changes in life. Some people see it coming years before and start to learn a new craft or business or they go to college to learn something new.It’s better to have a parachute ,or plan B , or whatever you want to call it, but don’t rely on only one stream of income. When I first started writing online, I was following a dream I had always held of being a writer. I wrote articles and I had fun. Someone mentioned blogging so I thought I would try it with a free blog. Then I made some friends (like you!) who were selling ebooks. I thought that was awesome and so I tried it. Now I’m living the dream. I’ve successfully lived on my book royalties since 2011 and published quite a few books. It was a lot of work but I enjoyed it then and I still enjoy it now. That’s such a great story Annie. Will check out your books and website. Thanks for the share. Thanks for sharing that, Annie. It’s been great seeing you do your thing over the years. You’re a great example of the fact that what matters is that you do what resonates with you. You have to experiment and see what works (for you). I think what you said, ” It was a lot of work but I enjoyed it then and I still enjoy it now,” is poignant. At the moment, this is what I’m considering. I’ve worked a lot towards my business idea/dream but then recently realized I didn’t really enjoy the work of it all. Especially the marketing part. So now, I’m giving myself some distance from it and seeing what comes up. It makes a lot of sense though to work hard at something and to enjoy it. If one works hard and doesn’t enjoy it, someone tell me what is the point of that? A simple yet elegant post. I have started to do this also. I have a general direction but I no longer hold expectations or try to reach my sky high goals because I find that it will just make me sad. I am now just focusing on doing the things I enjoy and things seem to actually be working out better and I have less stress so I can’t complain. : D Thanks for the reminders to keep going on the path I am going. Much enjoyed. This was a slow realization for me, that I’ve only really come to grips with in the last year – I don’t need to make elaborate plans or mighty struggles, but just continue inching upward. Cultivating happiness and recovery from addiction have much in common. Day by day. I’m glad you shared this article. I’ve been freaking out lately reading all the gurus who talk about having to get laser precise about everything. But I can’t seem to pigeon hole myself. I write with passion about a ton of things. I want to keep doing that. And it’s been working! I doubled my traffic for 4 months until the #s became unreasonable to continue the trend. I haven’t found a way to monetize yet, but I’m going to stop worrying about all these metrics and markers and just create the best stuff I can. Thanks man, what a load off the mind! The problems start when you try to do something you can’t do. You can’t force yourself to be specific. No need to push. Instead, relax and do what you can with what you have. I love your outlook on life. I understand you’ve been through a lot over the years, but you just seem so at peace with everything. Reading your stuff almost has a calming effect on me. I am the opposite right now, whereas I am trying to force my fledgling business to grow as fast as I can. Actually, I am not taking all the action I need to to grow it, but I am stressing myself out like I am! I can relate to the stressing yourself out. That’s what I used to do. (And still do from time to time. I’m not immune). But then I began to notice that it wasn’t helping. In fact, it was making things worse. I read your names and feel like I’m talking to old and new friends — Henri, Pooja, Stuart, Patrik — but today I just had to comment on Annie. Annie, I read your bio on Amazon…you are AMAZING, and quite a writer. That is some story. God bless you, sweetheart. Everyone, if you want an uplifting story that will make your day, you should read her bio on Amazon. That’s bound to make me stop whining for a while. Love it, and thank you! Annie also gives everyone a tip on where to get the best price on Microsoft products in her ebook, How to Write eBooks for a Living. waysale.com/wholesale_microsoft_office. You can get Office 2010 for about $23. It’s a Microsoft site. Thanks again, Annie. You’re an inspiration. I’m getting your ebook, and I love it if we could be friends sometime in the future. Wow. Reading your post acted as a tranquilizer! No, no! I didn’t mean it put me to sleep! Quite the opposite. It calmed me, and woke me to the realization that I’m doing what I love – getting my “genius” onto paper, in print, into contests, in my blog (dialogondialogue.wordpress.com). And… that I’ve won quite a few awards is reward for my efforts. However, always nagging me was that I’m not a technical whiz, I don’t sit for hours keeping up with the scores of social media, worrying about my ratings on Amazon, Linkedin, and everywhere else, nor do I want to! When I stand at the Pearly Gates, I have the feeling St. Peter would be totally unimpressed if all I could say was, “I was a technical and literary genius. I outdid everyone else at self promotion in life and on social media, and I made tons of money…which I had to leave behind. You can fix that, right? By the way, you’ve made certain my mansion in there has oceanfront, yes?” I leave that mindset to the political scene! Right now I feel stuck because I’m trying hard to become who I’m not. I’ve been working hard at becoming a good writer when my strength is actually in speaking. I am wasting time on blogging when podcasting and vlogging could do. Right now, I just got the push I need. God bless you. I woke up this morning thinking my life was too cluttered and sent out an intention to Spirit to do something about it. As synchronicity would have it, within an hour Henri’s e-mail arrived linking to the above article which led me to his book Follow Your Heart. Maybe that’s all I need, declutter and follow the breadcrumbs. Thanks again Henri. As always, Henri, I look forward to what you have to say; your way of thinking resonates with me. I really like where you said that what you are suggesting goes against conventional advice. Conventional advice usually does not resonate with me and stresses me out. Being all stressed is not going to help me find what excites and is magnetic to me, as you describe. I’ve only just found you, and what a lot of sense you write! I’ve been struggling with so many aspects of technology, that I feel overwhelmed; my writing was suffering to the extent I wasn’t doing any. That changes, as of now. Thank you. Thank you Henri! Just read your article over the phone for my girlfriend. We’re are all feeling much better to keep embracing our dark nights. Hope the best will come to you!